Mike Lang, Welding Director explains why UA Local 501 switched from acetylene to hi-pressure natural gas for brazing training. to read about the advantages of brazing copper and silver soldering with hi-pressure natural gas! to read about how natural gas can improve your brazing and silver solder operations! 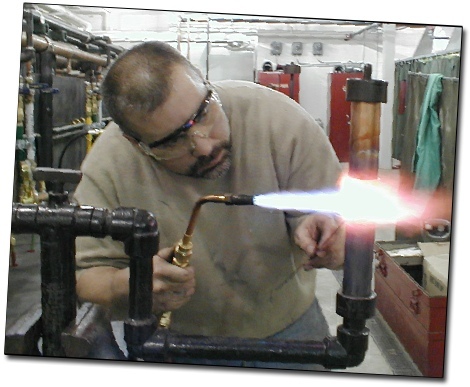 When you switch to high pressure natural gas for brazing keep the torch handle you already have and use a G-TEC mixer, gooseneck and tip combination. G-TEC tips are modular allowing you to mix an assortment of gooseneck lengths and many sizes of single flame and multi flame tips. 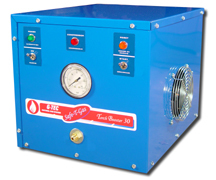 Learn more about G-TEC Natural Gas Tips for brazing. 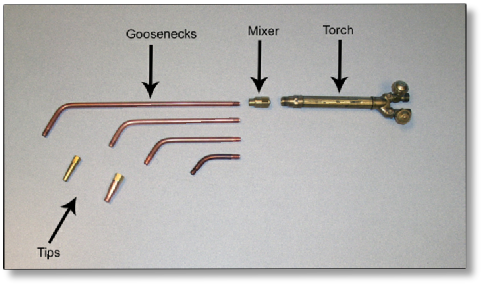 G-TEC brazing tips are modular, allowing you to mix gooseneck lengths and single or multi flame tip sizes for the right fit for your job! A natural gas flame wraps the entire joint for even heating and a better braze. 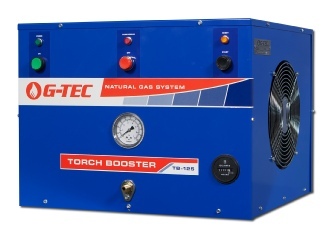 G-TEC Torch Boosters connect to a standard utility gas line and boost pressure as high as 45 psi. Just turn the Torch Booster ON at the start of the first shift and OFF at the end of the day - you get an endless supply of high-pressure natural gas for your brazing torches. Torch Boosters deliver gas in exactly the same way as a cylinder or bulk tank,except that you save money and never run out! TB-30 - For shops with one oxy-fuel torch TB-30 boosts utility gas pressure to 25 psi at 30 cf/hr and will operate one oxy-fuel brazing torch. TB-30 measures only 12’ wide and 12” tall with a depth of 16” and is easy to install almost anywhere. TB-60 and TB-125 Torch Boosters are in cabinets that measure 20” wide, 16” tall and 18” deep,about the size of a window air conditioner. Get more information about TB-60/TB-125 Torch Boosters. TB-250 - When your shop has up to 6 torches TB-250 can boost gas pressure as high as 45 psi and deliver enough gas to run 6 brazing torches at once. Install a regulator to set get pressure between 1-45 psi. TB-500 - When your shop has up to 12 torches TB-500 is our biggest Torch Booster and can boost pressure to 45 psi at 500 cf/hr, enough to supply 12 brazing torches at once. Install a regulator to set gas pressure between 1-45 psi. TB-250 and 500 systems measure 28” wide, 20” tall and 24” deep. Get more information about TB-250/TB-60 Torch Boosters. Do you have more than 12 brazing torches or multiple production stations in your shop? Good news! Torch Boosters can be connected to a gas manifold to supply multiple cutting tables or production areas, and if you have more than 12 torches in your facility, multiple Torch Booster modules can be connected together. Based on your torch cutting requirements G-TEC will design the right combination of Torch Boosters for you! When the United Association of Plumbers Local 501 near Chicago switched from acetylene to hi-pressure natural gas to teach medical gas and refrigeration brazing, their apprentices started passing their exams 25% sooner!